Don’t Let Your Ionized Acidic Water Go Down the Drain! Most people purchase a water ionizer for the vast health benefits of drinking alkaline ionized water. However, alkaline water is only half of the benefit of owing an ionizer. The by-product that water ionizers produce–ionized acidic water–has a myriad of benefits from body, skin and hair care to household and industrial cleaning. Ionized acidic water is water rich in H+ ions, which occurs when water ionizers electrolyze ordinary tap water and separate them into two streams–alkaline and acidic. The water is divided at a 70:30 ratio, and oftentimes, users allow the acid water to travel from its rubber drainage spout right down the drain, literally wasting one of the most versatile, eco-friendly products on the planet! Fortunately, it is possible to collect and store ionized acidic water effectively. It should keep its strength for 90 days provided that you minimize its exposure to light and oxygen by storing it in a closed, opaque container. Chanson water has been 3rd party lab tested and verified to make strong acid water which disinfects on contact when made at 2.7 pH. Many brands of ionizers can’t make strong acid water, or can’t make it without using chemical solutions. Chanson is very proud that our machines can make strong acid water in 70% of all water sources without alteration, and for the remaining 30% we are the first company to use natural mineral-rich Himalayan salt instead of chemicals to create strong acidic water with the Chanson Miracle M.A.X. water ionizer. Collect it in cups or a watering can and use it to water plants daily. Most potted plants and plants in your landscape crave acid water, and will thrive and grow faster when watered with it. Purchase some small cobalt or amber glass spray bottles to fill with 2.7-5.5 pH water and store in the medicine cabinet, and your purse or gym bag. Use as an all-natural facial toner, hand sanitizer, aftershave, deodorant and on rashes and bug bites. Collect it in a bucket and use to wash your car, bike, motorcycle or boat with. Fill opaque plastic spray bottles with 2.7-5.5 pH water, and store them under the kitchen and bathroom sink. Use for household cleaning and disinfecting purposes like glass, tile, floors, stain removal, sinks, toilets, doorknobs, and cutting boards. Must be 2.7 pH to disinfect, and not all brands of ionizers can produce water this low without chemical alteration. Recycle an empty opaque shampoo or conditioner bottle and use 5.5-6.0 pH ionized acid water as a final hair rinse. Collect in cups and use to pre-rinse dishes before loading into the dishwasher. Recycle an empty mouthwash bottle, fill it with 2.7-3.5 pH ionized acid water and add some peppermint or spearmint essential oil for minty freshness at a fraction of the cost of commercial, alcohol-based mouthwashes. Collect it in a bucket and use to wash Fido to keep his coat shiny. Still have more acid water than you know what to do with? Consider bottling and giving some away to family, friends and neighbors with some suggestions on how to use it, and offer to let them refill their own bottles. Or you can even try selling it. Our SkinBalance product retails for $19.95 and is still only a fraction of the cost of the high-end skin care products it replaces. After introducing acidic water to your friends and family, people are bound to want to know how they can get their own ionizer. You can become a Chanson Water dealer or affiliate and make money off of each sale! Don’t have a water ionizer yet? What are you waiting for? Pick one up at www.chansonwater.com and start enjoying the benefits of ionized water today! This is the fourth installment of our alkaline foods series where we feature a food from A-Z, sharing the benefits of the food along with suggested recipes to try! There are several reasons not to drink cow’s milk, and fortunately several alkaline alternatives exist. Almond, coconut, soy, and rice milks are the most popular dairy-free milks lining the store shelves, but you can also make your own cashew milk or other nut milk. Because rice milks tend to have the highest sugar content and there are many issues associated with soy, we primarily recommend unsweetened almond and coconut milks. It’s easy to make your own fresh nut milks–just soak the nuts for 24 hours, blend a handful or two of nuts with a pitcher of Chanson ionized alkaline water, and strain through a fine sieve. For more alkaline recipes from around the web, visit and follow our Alkaline Diet & Recipes Pinterest board. Stay tuned for next week’s installment of our alkaline foods series: E is for Eggplant. Air fresheners are a quick fix to cover up foul odors or freshen up a room. Americans alone spend upwards of 1.72 billion dollars on air fresheners annually. But behind their sweet-smelling mask lies a host of toxic chemicals, which can create all kinds of health issues. The illnesses associated with frequent air freshener use are far and wide, with babies and expectant mothers being the most at risk. Babies tend to suffer more bouts of diarrhea and earaches, while adults may experience headaches, depression, itchiness, congestion, respiratory problems, high pulse rates, nausea, and other ailments. Be advised that no matter whether you choose a commercial air freshener in the form of an aerosol can, spray bottle, plug-in liquid or gel, carpet foam or powder, even cardboard car fresheners, incense, and many candles–you are exposing yourself and your family to harmful chemicals. Ionized acidic water from a Chanson water ionizer is non-toxic and has antibacterial properties that can kill odors on contact. You can make your own all-natural air freshener spray by filling a spray bottle with ionized acidic water and a few drops of your favorite essential oil(s). Then just spritz any time you would a commercial air freshener. Unlike chemicals, essential oils contain healing and beneficial properties. Try experimenting with oils of lavender, ylang ylang, sage, rosemary, lemon, lime, and grapefruit to create a fresh, natural scent. We use and recommend Young Living essential oils. Many of the toxic chemicals listed above are also finding their way into our drinking water supplies, so investing in a quality pre-filter or whole house water filter is also crucial to health. Visit www.chansonwater.com for more information. This is the third installment of our alkaline foods series where we feature a food from A-Z, sharing the benefits of the food along with suggested recipes to try! Cucumbers are 96% alkaline water and low in calories. They contain fiber, potassium, ß-carotene and α-carotene, vitamin-C, vitamin-A, vitamin-B, vitamin-K, vitamin-D, B1, B6, folate, calcium, magnesium, silica, zea-xanthin and lutein. For more alkaline recipes from around the web, visit and follow our Alkaline Diet & Recipes Pinterest board. Stay tuned for the next installment of our alkaline foods series: D is for Dairy-Free Milk. Dr. Lynda Frassetto of the University of California believes that humans have undergone an evolutionary change. Formerly, our bodies were able to effectively break down food and dispose of acid wastes with our kidneys and liver by using an ample supply of bicarbonate and hydroxyl buffers. But now–because we encounter more toxins, chemicals and pollutants in one day than our ancestors did in a lifetime–our bodies are struggling to keep up and to protect our kidneys and liver from total degradation and failure. Dr. Frassetto studied 1,000 people and discovered that as we age, we lose buffering capacity in our blood, which reduces our ability to neutralize and remove acids. Since we cannot neutralize all the acid waste, it accumulates in our fatty deposits instead of being eliminated by our kidneys and liver as it once was. Basically, our bodies have made the decision to preserve our kidneys and liver instead of processing the acid waste, and these wastes now show up as cholesterol, fatty acid, uric acid, sulfate, phosphate, kidney stones, etc. A healthy, pH-balanced body has alkaline reserves to battle diseases, infections, and viruses. But when our bodies are excessively acidic, they borrow essential minerals such as calcium, sodium, potassium, and magnesium from our vital organs and bones to “buffer” (neutralize) the acid. Excess acids in our bodies build up until we begin to show symptoms like digestive problems, headaches, excess weight, bone pains, constipation, muscle tension and pain, heart problems, high blood pressure, etc. When our bodies suffer from prolonged degradation or corrosion, it can manifest into dehabilitating and degenerative diseases like diabetes, hypertension, and osteoarthritis–all which tend to show up around age 45. One easy way to rid your body of excess wastes and restore proper pH balance is to drink Chanson ionized alkaline water, which is able to deeply hydrate and detoxify the tissues and cells, and supply the body with bioavailable minerals and antioxidants. Not only will Chanson ionized alkaline water help neutralize acidic wastes and build up ionic alkaline reserves, but its smaller molecular cluster size and negative electrical charge make it up to six times more hydrating than conventional water and allows the body to metabolize stored fat. Visit www.chansonwater.com for more information. This is the second installment of our alkaline foods series where we feature a food from A-Z, sharing the benefits of the food along with suggested recipes to try! Broccoli is a cruciferous vegetable rich in potassium, magnesium, calcium, vitamin C, vitamin A, fiber, protein, beta-carotene, zinc, selenium, carotenoid lutein, Vitamin B6, glucoraphanin and folate. For more alkaline recipes from around the web, visit and follow our Alkaline Diet & Recipes Pinterest board. 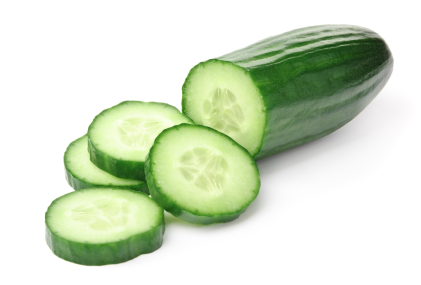 Stay tuned for the next installment of our alkaline foods series: C is for Cucumber. The average women applies a whopping 535 acidic chemicals to her skin daily, 60% of which are absorbed into her bloodstream. Clearly, what we put on our body is almost as important to health as what we put in it. Municipalities use chlorine and chloramines to sanitize our water supply, but those chemicals can wreak havoc on your health when consumed, absorbed, or inhaled as a steam. Even just a 10-minute shower can cause you to absorb more chlorine than if you drank 64 ounces of the same water. Installing a Chanson Spa Shower Filter is a quick and easy way to reduce your exposure to chlorine, and will soften and energize your water in the process, creating softer, shinier hair and smoother skin. Most body washes and shampoos contain sulfites and other chemicals. Liquid castile soap is a safe, paraben and sulfite-free gentle cleanser that can be used on the body and hair. You can also try forgoing conditioner and just rinsing hair with ionized acidic water from a Chanson ionizer for an all-natural shine. Fluoride is slightly more toxic than lead, and if ingested, a tube of fluoridated toothpaste could kill a small child. Try a fluoride-free toothpaste or make your own by mixing a blend of baking soda, peroxide and peppermint or spearmint essential oil (optional). Most mouthwashes are filled with alcohol but you can look for alcohol-free versions or make your own by adding a couple drops of peppermint or spearmint essential oil to a bottle of Chanson ionized acidic water. Parabens are common preservatives that have been linked to cancer and can cause allergies. Fortunately, many popular brands of moisturizers now offer paraben-free versions of their lotion formulas. Most facial toners are also full of alcohol which is very drying to the skin. Chanson ionized acidic water is a wonderful all-natural facial toner, aftershave, and hand sanitizer, and you can even spray it on rashes, scrapes and bug bites to help the healing process. Make your own for pennies on the gallon with a Chanson water ionizer (prices start at $1,295) or try a 4 oz. bottle of our SkinBalance product for $19.95. Most deodorants on the market contain aluminum, which is easily absorbed into the bloodstream and considered to be a possible cause of Alzheimers disease. Look for aluminum-free varieties or try making your own. The average woman will eat nearly four pounds of lipstick in her lifetime, and an FDA study found lead in 100% of the lipsticks they tested. Consider mineral makeup for everything from eyeshadow to lipstick to reduce your exposure to these harmful toxins. Commercial sunblocks and sunscreens contain a host of toxic ingredients that can lead to cancer and other health issues! Natural, mineral-based sunscreens that you can buy or make yourself are an alkaline alternative. Most perfumes on the market are synthetic and put in a base of alcohol. Seek out all-natural scents or try making your own by blending essential oils in a base of jojoba oil. Today marks week one of our alkaline foods series, where we will highlight an alkaline food from A-Z, sharing the benefits of the food along with suggested recipes to try! Alkaline diet pioneers Dr. Robert and Shelly Young consider the avocado to be “nature’s butter” and a perfect food, believing that you should consume 2-3 avocados per day! While some people shy away from avocados mistakenly believing them to be fattening, science has shown that they contain mostly healthy fats, provide fuel for the body, and are easy to digest. Avocados are also a fruit, not a vegetable, despite their non-sweet taste. Avocados are rich in nutrients, with vitamins A, B-complex, C, E, H, K and folic acid. They also contain magnesium, copper, iron, calcium, potassium and many other trace elements which help buffer acids. They provide all 18 of the essential amino acids plus 7 fatty acids, including omega 3 and 6. At 70-80% water, avocados are hydrating, contain more protein than cow’s milk, and more potassium than bananas. Consuming the vitamins, minerals and amino acids found in avocados have shown many health benefits including: lowers blood pressure and cholesterol levels, ability to inhibit the growth of tumors (particularly prostate tumors), defends against diabetes, heart disease, strokes, and cancer, slows the aging process, protects against eye diseases such as cataracts and macular degeneration, aid in red blood cell regeneration and the prevention of nutritional anemia. For more alkaline recipes from around the web, visit and follow our Alkaline Diet & Recipes Pinterest board. Stay tuned for the next installment of our alkaline foods series: B is for Broccoli. Antacids are the #1 selling over-the-counter medication, and the 4th most prescribed prescription drug in the world today. They provide a quick fix for common digestive problems like heartburn, acid reflux, bloating, and gas pain which are caused by excess acid in your system. The reason that antacids like Tums, Alka-Seltzer, Mylanta, Rolaids and Maalox work is because they all contain alkaline minerals like calcium carbonate, magnesium hydroxide, and sodium bicarbonate. These alkaline minerals are then able to help neutralize the acid. But just like how that adding alkaline minerals like baking soda and sea salt to your water to turn it alkaline is not a long-term solution because it can create health problems of its own, so can taking antacids like Tums on a regular basis. When you ingest overly acidic foods, your body seeks to neutralize those acids naturally by pulling alkaline minerals from its internal reserve. This is because our blood must remain at 7.4 pH in order for us to live, and the body will do whatever it needs to in order to preserve that delicate pH balance. When your alkaline reserves are low (as we age and continue to eat more and more unhealthy foods), it may have to resort to pulling alkaline minerals from places like our bones, heart and eyes, hence the rise in osteoporosis, heart failure and poor eyesight among middle-aged and elderly people. Blocking or reducing the production of your stomach acid by ingesting antacids can leave you undernourished, because your body may not be able to properly absorb the proteins and vitamins from your food. When you are undernourished your immune system can break down, making you more susceptible to things like food poisoning, parasites, peptic ulcers and more. These can be caused by the fungi and bacteria in your food that would normally be killed by the stomach acid. When you follow an alkaline diet consisting of 80% alkaline foods and drink plenty of ionized alkaline water, your odds of experiencing common digestive problems decrease dramatically. Think about it. When was the last time you experienced heartburn, bloating or gas pains? It most likely wasn’t after finishing off a plate of steamed veggies or a healthy salad. No, those issues usually arrive after you eat things like a burger and fries–unhealthy acidic foods our bodies have a hard time digesting. So rather than treat the symptoms of overacidity with an over-the-counter or prescription antacid which can cause further health issues, we recommend that you eat more alkaline foods and drink Chanson ionized alkaline water daily. For more information on the benefits of ionized alkaline water visit www.chansonwater.com.